Learn about our land conservation efforts, roadside trail reroute, and bridge restoration at Goosepond Mountain. Thank you for being a friend and supporter of the Trail Conference! Join us as we explore what your support has helped accomplish. On this 2.5 mile hike, you will learn of the advocacy efforts to create a greenway from Sterling Forest to Storm King with the purchase of 14.3-acre parcel that connects Goosepond Mountain and Sterling Forest. Discover a new section of the Highlands Trail that was rerouted, eliminating 1 mile of road walk. 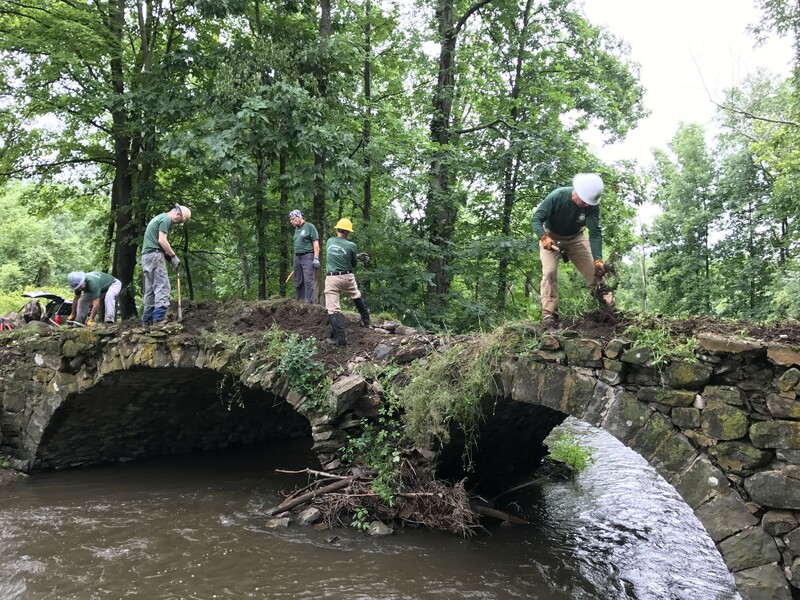 Admire the impressive repair of a stone arch bridge over Seely Brook by our Long Distance Trails Crew. Please plug in coordinate planes, 41.308162, -74.247540 into your GPS for meeting location. Remember: Dress for the conditions, bring plenty of water, snacks, wear sturdy shoes and bring mirco-spikes/crampons for icy trail conditions.